Complete gift set for winter storage and preventive maintenance of your scooter. 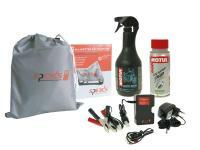 This Racing Planet gift set brings everything you need to keep you vehicle safe and in good condition. Prevent the scooter from not starting next season. Motul Moto Wash to remove oxidizing dirt, such as insects, before winter and avoid paint damage.